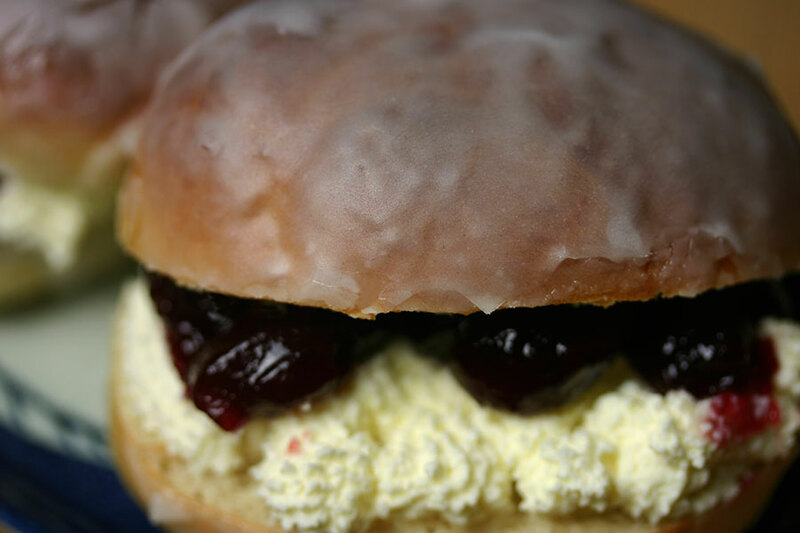 I was pleasantly surprised by these iced filled buns, which are like homemade, fresh and delicious jam doughnuts. Or sweet hamburgers. Needless to say, the girls adored them. As I’m not keen on strawberry jam, I opted to fill mine with raspberry instead. It’s not the most photogenic of jams, appearing dark and gelatinous in the photos. With these filled iced buns I complete my Great British Bake-off signature bake challenge – better late than never. I went with this iced bun recipe from Paul Hollywood, though I ended up adding much less water than specified to what was already a wet dough. I also declined to sprinkle icing sugar on top of the icing before serving, but otherwise followed his recipe to the letter. To make the dough, mix together the flour, caster sugar, butter, eggs, yeast, salt and milk a large bowl. Gradually add the remaining water to form a wet dough. Knead in the bowl for a few minutes, then turn onto a lightly floured surface and knead until the dough is smooth and elastic. Clean and butter the bowl before returning the dough to it. Cover with clingfilm and let rise until doubled in size. Divide the dough into twelve equal pieces. Shape them into 5-inch (13cm) long fingers. Place the dough fingers on a greased baking tray, leaving room for them to double in size, cover and let rise for about 45 minutes. Preheat the oven to 425°F (220°C) and bake the fingers for ten minutes. Set aside to cool. To make the icing, measure the icing sugar into a wide bowl. Add the water to make a thick paste. Dip the top of each finger into the icing, then leave to set on a wire rack. Lightly whip the cream and spoon it into a piping bag Spoon the jam into another piping bag. Slice the fingers horizontally. Pipe a line of whipped cream into the middle of each finger, followed by a line of jam.